In the wake of a lawsuit filed in federal court against CollegeTimes’ former web hosting provider over negative student reviews, the Wikipedia website has banned Neumont University for reasons of vandalism. Wikipedia, one of the largest collections of encyclopedic reference material in the world, has blocked Utah’s Neumont University from making further contributions to their online content database over claims of ongoing vandalism by the university. 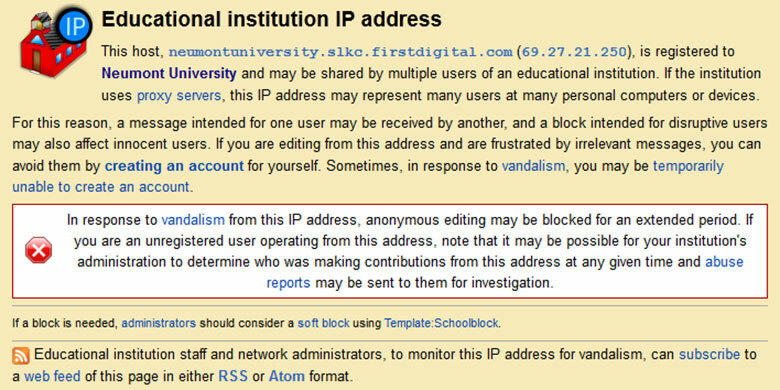 The IP address range belonging to Neumont, 69.27.21.250, has a publicly viewable profile on Wikipedia.org where dozens of warnings from various Wikipedia editors are visible, culminating in a permanent IP-ban during November 2012. Neumont, a for-profit and regionally-unaccredited institution incorporated in Delaware that maintains its only campus in South Jordan, Utah, was recently rejected by the state government of Rhode Island after trying to win approval for a new Providence-based campus there, according to reports from the Providence Journal. The technical college, formerly known as North Face Learning, was founded in 2003 by a group of Mormon investors from Utah, and has suffered from various controversies since its inception. According to Wikipedia and the New York Times, Neumont wasn’t initially able to attain fully extensive financial insurance until Gary D. Kennedy, a well-known investor from Salt Lake City, had been excused from their board of directors, because of Kennedy’s having been sued multiple times by the U.S. Securities and Exchange Commission for fraudulent accounting practices. The Wikipedia controversy is the latest in a string of online incidences involving Neumont University after the school filed a lawsuit in federal court demanding an injunction and restraining order against the CollegeTimes website, which allegedly refused to delete multiple negative student reviews of the university. Rather than taking up issue with CollegeTimes directly, however, court records show that Neumont opted instead to sue Little Bizzy, the small Nevada-based web hosting provider that formerly hosted the CollegeTimes website. The lawsuit, filed in the US District Court of Nevada (Case No. 2:12-cv-01395-GMN-PAL), is currently pending dismissal. Earlier this year, both CollegeTimes and Little Bizzy publicly accused Neumont University of engaging in multiple foul business practices. In a recent article published on CollegeTimes, the college reviews service accused Neumont of paying their employees to post “fake” positive student reviews of Neumont around the internet to falsely boost the online reputation of the institution, and of also conspiring with the Salt Lake Tribune in an effort to falsely report on the Nevada lawsuit. In an earlier press release, Little Bizzy’s founder, Jesse Nickles, accused Edward Levine, the president and CEO of Neumont University, of sending out his own private investigator for the sole purpose of “scaring” and “bullying” Nickles and his family members on multiple occasions. Nickles now says he plans on filing a complaint against Levine and Neumont for stalking and harassment. “Edward Levine is a coward who thinks he can bully anyone that happens to have less money than him into doing whatever he says. Neumont University’s other investors should be ashamed – but apparently they are not,” said Nickles. Browsing the “talk” page of Neumont University on Wikipedia, a section dedicated to resolving problems with article content, shows that the debate over Neumont University’s involvement with the page has been ongoing since at least 2005, when the page was so riddled with promotional wording that editors nominated the entry for complete deletion. Multiple debates have sprung up during the ensuing 7 years since then, revolving around claims that Neumont University employees and/or contractors continue to vandalize the page with the goal of positively distorting the school’s reputation with little regard for Wikipedia’s encyclopedic guidelines, which call for purely neutral and non-promotional content that must be referenced by authoritative 3rd party sources. Most recently, in December 2012, Philippe Beaudette, the Director of Community Advocacy for the Wikimedia Foundation, left repeated and public demands on Neumont University’s profile pages – including an apparent “sock-puppet” account (a duplicate-identity account, which is prohibited by Wikipedia guidelines) called “Nemont” – for the university to immediately contact Wikipedia staff, but no replies from Neumont University administrators are currently visible on the pages. Update 1/5/2013: Neumont appears to have created yet another sock-puppet account called NUDOE, in violation of Wikipedia guidelines. When asked, among other questions, if Neumont had ever made any donations to the Wikimedia Foundation, or had given money to any associated Wikipedia editors or staff members, John Krieger, an attorney from Lewis and Roca LLP who is representing Neumont in the lawsuit against Little Bizzy, initially promised a reply to Nickles but later reneged and refused to offer any further responses. Wikipedia.org, now the 6th most visited website in the world according to Alexa Internet, Inc, relies heavily on contributions from thousands of volunteer editors to support the community’s massive amount of publicly licensed reference articles.